In 1867, The United States purchased a huge 586,412 square miles of land from Russia for about $7,200,000 (about 1.9¢ per acre). Despite what appeared to be a bargain even at that time, some members of the press strenuously objected and derided the purchase calling it 'Seward's folly', "Seward's icebox", and "Andrew Johnson's polar bear garden". Nevertheless, we all know that this turned out to be a brilliant purchase for the USA. In the summer of 2011, I had the opportunity to cruise to Alaska twice abroad a luxury passenger ship. During these trips I learned a number of interesting facts about the huge state of Alaska and have decided to re-organize my many spoons about Alaska into a readable narrative. Many of these spoons are already in other categories, so I will provide links for followup if you desire. 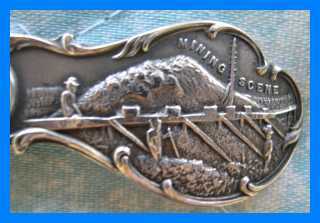 The modern story of Alaska begins on July 17, 1897 when the SS Portland entered Puget Sound and docked in Seattle. 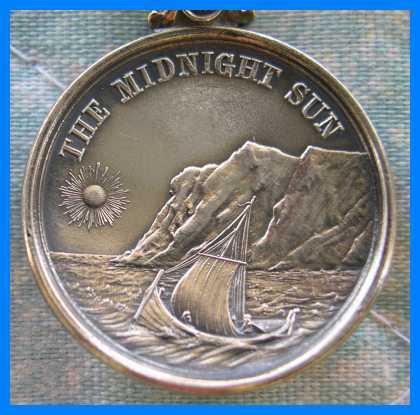 The newspapers claimed that the ship contained 'tons' of gold and that there were 68 fabulously rich miners on board. 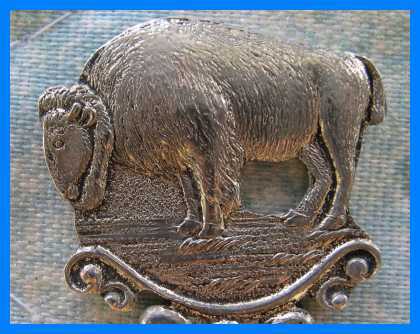 Needless to say, word of this find quickly spread across the entire United States and an estimated 100,000 people suddenly got "Klondike Fever" which caused them to give up jobs and families and proceed to Seattle where they planned to embark for the fabulous gold fields of Alaska and the Yukon in Canada. 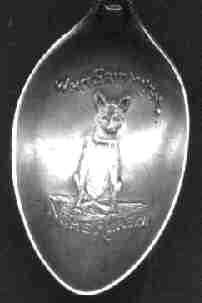 This was also during the time period when the souvenir spoon 'frenzy' was at its height, so it is not unusual that we find a number of spoons from Alaska. Presented in this exhibition are just a few of the many images offered by this immense state. 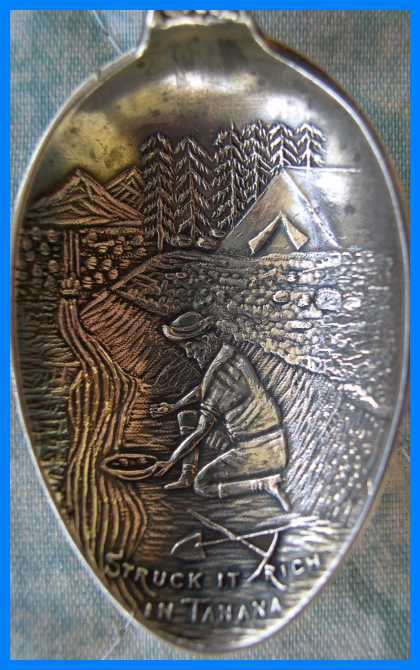 Generic images of Alaskan gold mining on spoons. Note: a lot of other minerals are also mined in Alaska. Tanana is located at the confluence of the Tanana and Yukon rivers. 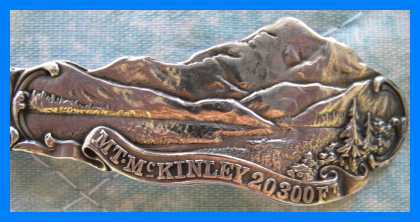 Hand engraved skyline view of Valdez, Alaska. 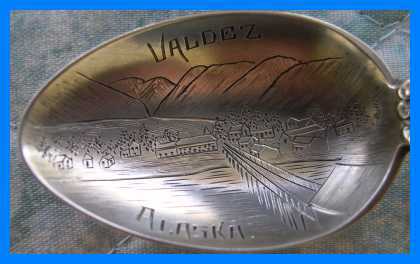 Today, Valdez is best known because of the huge oil spill that occurred there on March 29, 1989, but this spoon was made about 90 years prior. The City was founded just prior to the turn of the 20th century as a gateway to the “All-American Route” to the gold and copper fields. 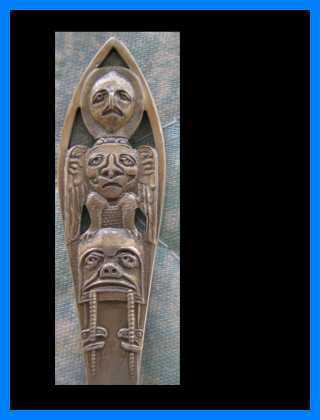 These totem poles were not for religious purposes but were used to identify clans or to honor a person or event..
cute Nome, Alaska spoon with the dog saying "who said mush?" I had the opportunity to meet Libby Riddles who was the first woman to win the grueling Iditarod dog sled race. She gave me a lot of fascinating insights into how husky dogs are raised and trained. In 1910, Douglas was the largest city in Alaska and the home of the Treadwell Mine which for awhile was the largest gold mine in the world. 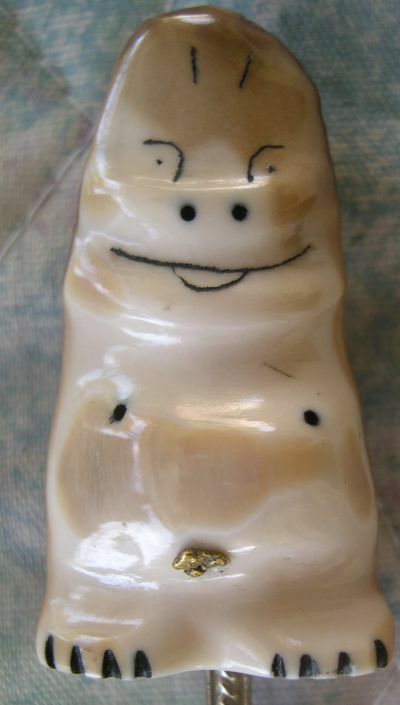 This Billiken is carved from an antique walrus tooth and a gold nugget is used for its belly button. I am not sure of the metal composition of the spoon portion. The Billiken is known as the "God of the ways things ought to be"
The billiken is a doll patented in 1908 by Florence Pretz of St Louis, Mo. but it has been adopted by Alaskans. Of course the main impetus for Alaskan growth at that time was gold. Surviving placer gold nuggets represent less than one tenth of one percent of all the gold that has ever been mined. Of the roughly 100,000 people who got "Klondike fever" about 25,000 actually made it to the gold fields of Alaska and Canada. Most ended up working for others or died. About 4,000 actually found substantial gold. Most of those ended up losing their gold to thieves, women, liquor, gambling etc. Approximately 50 are known to have 'retired' from their gold discovery. note: there is still a substantial amount of gold in Alaska and Canada, but mining is now a very high capital and high risk business.